Since Dia Cooley, our first volunteer in 2007, over 2,500 international volunteers and interns, from more than 25 different countries, have participated in our projects. Something we often hear at close of project interviews, is the enjoyment that our volunteers have had in getting to know our international group. In terms of distance, North American volunteers at Friends for Asia travel much farther than their European and Asia Pacific counterparts. The distance to Asia from both shores of North America is more than 8,000 miles. Even so, Americans account for more than a third of the FFA volunteer base, making this the single biggest demographic at work here. See more information about our American Volunteers. Australians were among the first Western tourists to embrace the opportunities for travel in Asia. Today, Thailand, Nepal, Bali and Vietnam are premier destinations for Australians. In fact, the flight path to our volunteer project site destinations are some of Australia’s busiest outgoing routes. See more information about our Australian Volunteers. Canada supplies a small slice of the international tourist trade in Asia, accounting for roughly one out of every hundred tourists on the continent. However, those Canadians who venture out here include some of the most conscientious and committed volunteers on the scene. See more information about our Canadian Volunteers. At Friends for Asia, we have also been impressed with the sense of conviction German travelers feel when it comes to giving back to the places they visit. 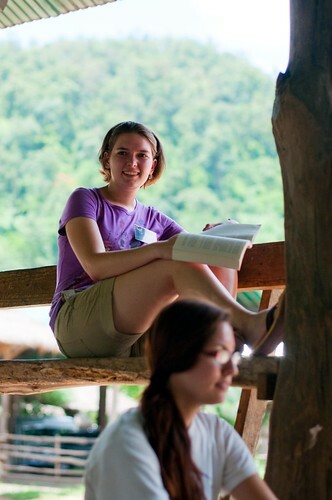 Here in Asia, one out of four of our volunteers comes from Germany. That’s a substantial chunk of our volunteer base, which is why we design and implement volunteer programs that are accessible and meaningful to volunteers from Germany. See more information about our German Volunteers in Asia. Dutch volunteers have played an important role in FFA’s work since we rolled out our first line of projects. People from the Netherlands may account for less than 2 percent of Asia’s international tourist arrivals, but they’ve made up roughly 15 percent of our volunteer work force to date. From our perspective, Dutch travelers are some of the most motivated volunteers at work in Asia. See more information about our Dutch Volunteers in Asia. Friends for Asia is uniquely positioned to welcome visitors from New Zealand to Asia. Our network of project sites provides dynamic volunteer opportunities in the country, and our diverse work force enriches each assignment. On top of this, Asia is bursting with off-the-beaten-track adventures that Kiwis appreciate. See more information about our Volunteers from New Zealand. The UK leads Europe in terms of sending tourists to Asia, accounting for roughly 20 percent of the continent’s contribution to tourism in Asia. There is no question that Britons are well-versed in the value of a holiday in the Land of Smiles. See more information about our British Volunteers in Asia. We’re detecting a growing trend of travelers over 50 years of age applying to Friends for Asia’s volunteer projects. Many travelers in this demographic are enjoying more freedom than they have in many years – their children are grown, retirement is on the horizon. This presents an ideal opportunity to travel abroad and make a difference by volunteering. We’ve got a great diversity in our volunteer base, ages from 18 to 68, men and women, and from over 20 countries. If your nationality is not found above, then you are not alone. See more information about our Volunteers from Around the World.